We met for the first time at Fosters, the unpretentious eatery in Durham and the perfect backdrop for a down-to-earth country girl named Margo Fariss Brewer. She was born in New York City but raised and nurtured on a ranch in rural Northern California. I sensed immediately that Margo was an optimist who loves life and equally a challenge. Her genealogy courses are extremely popular and she welcomes all students, those new to the research of their families as well as those more advanced and enmeshed in the stories of their ancestors. Classes I-II teach the student the basics of research, how to fill out forms, how to gather basic data, methodology, and organization, and analysis and critique of sources and data (building on many records including census, courthouse, school, church, military, and land plats) using primary and secondary sources of information. Classes III and V are more advanced genealogy, done in the computer lab and crafting a research plan and/or working on an established plan with the assistance and guidance of Margo. Class IV assists the student in writing their genealogy research as a narrative. The focus is on adding historical context, flow, and increasing the reader’s interest in the story. Margo is a professional genealogist, organizing trips every fall with her business partner to Salt Lake City for those interested in doing research in the Family History Library (FHL)--the center and heart of genealogy. The Mormons, who consider themselves stewards of worldwide family history, believe we are all interrelated and family is of utmost importance. They scour the world, including the small courthouses in isolated corners of every state in the United States, copying and indexing all records, to be housed in the FHL. FHL has more than 3 million microfilms! 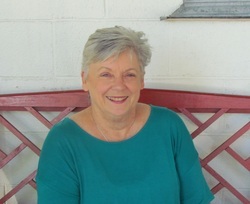 Margo is also a member of the Association of Professional Genealogists and the Genealogy Speakers’ Guild. Her business partner will chair the National Genealogical Society (NGS) conference in Ft. Lauderdale in 2016 and Margo will share co-chair responsibilities with another genealogist. Margo credits her interest in genealogy to her father, an American Overseas Airline and Pan Am pilot and rancher, who kept the past alive by sharing family stories. As a pilot her father believed that all pilots should know something about navigation and where they were in relation to the horizon rather than relying strictly on instrumentation. In life, too, we need to understand where we are going and where we have been; his philosophies were planted firmly in the head and heart of his daughter, Margo. Her aunt created a basic family tree for her when she was quite young. And so with her addictive compulsive nature, love of details, her tenacity to think outside the box to get around roadblocks, and her love of a puzzle, a genealogist was born. Margo will pilot a night course at OLLI for the coming winter term. The “OLLI at Night” course will be a second session of genealogy I. Please see the Winter 2015 catalog for a list of all her classes. Registration starts December 9 at 9:00 am. “Good genealogy begins with yourself. You must be able to prove yourself first. The best source is the oldest living generation. Many of my students chuckle because they ARE their oldest living generation!” Margo said with a quiet giggle.